Our existing church is about one-half the age of our parish. Our church is located in Erie, Kansas, near the center of historic Neosho County. The original Erie town company was formed in November of 1866 and the town was incorporated by probate court in December of 1869. During the early years Catholics in Erie attended Mass at St. Francis de Hieronymo in Osage Mission (now St. Paul) where Jesuit Fathers John Schoenmakers and Paul Ponziglione administered to their needs. The first known Mass said in Erie was in 1914 and St. Ambrose was made a mission parish of St. Joseph, South Mound, Kansas, in 1915. 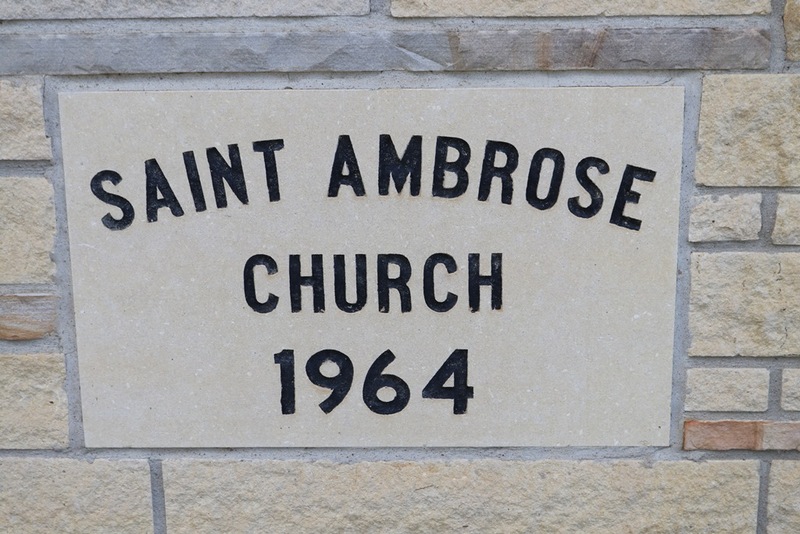 Follow this LINK for a complete history of St. Ambrose Catholic Parish. Our existing church is located at 519 North Main in Erie. The attractive stone facade building was dedicated in May of 1964 by Bishop Leo Christopher Byrne (coadjutor), with Father Thomas McGread  serving as pastor. At this time St. Ambrose was also elevated to full parish status within the Diocese of Wichita. This building, which replaced an earlier frame building, has served our parish for more than five decades. Our parish hall, dedicated in 1986, is located just west of our church. In addition to a large dining or event room and a fully equipped kitchen, the building also includes two separate meeting/class rooms, storage and restrooms. ​Use and rental of the building is managed by the St. Ambrose Altar Society. Saint Ambrose Parish Hall is located just west of the main church building. While there is no longer a priest in residence; the Rectory House is used for special events, meetings or as a guest house for visiting priests or parish visitors. 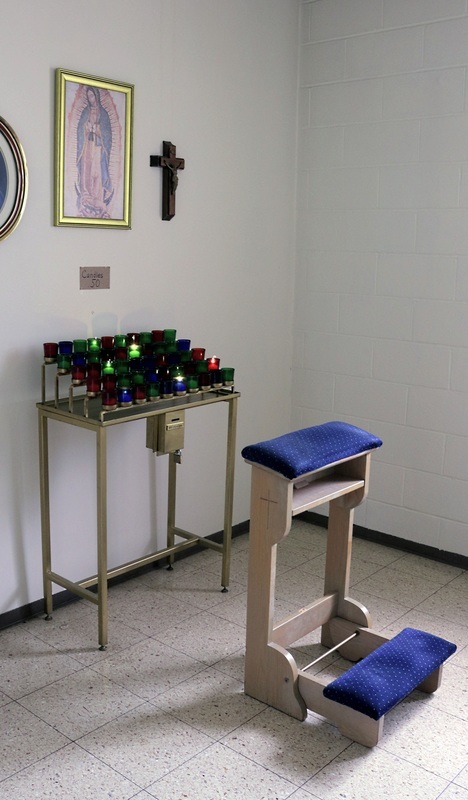 ​Use of the Rectory House is managed by the St. Ambrose Altar Society. (Note: Click HERE for other daily and weekend Masses at St. Francis Catholic Church, St. Paul. Sunday 7:30 a.m. - 7:55 a.m.
Thursday 8:00 a,m. - 8:25 a.m.
Also, confessions are heard in St. Paul on Saturday from 4:30 - 5:15; and before all weekday Masses. Father Thomas McGread served as St. Ambrose pastor from 1963 to 1965. Later, in 1968, he was assigned to St. Francis of Assisi Parish, Wichita, where he served until his retirement in 1999. It was during his time at St. Francis of Assisi that he developed his vision of stewardship as a way of life. From his vision and leadership his three-fold concept of stewardship—Time, Talent and Treasure began to thrive and spread. It spread among parishes in the Diocese of Wichita, then among other dioceses and eventually around the world. We, at St. Ambrose, Erie, are proud to have been a part of his early efforts to conceive his concept of stewardship. Msgr. McGread passed away on April 1, 2013 at the age of 84. He is recognized as the most influential advocate of stewardship as a way of life. Note: The photo of Msgr. McGread is credited to Catholic Stewardship Consultants, Inc. All other photos were taken or edited by stfrancis-stambrose.org.